Hope you have been having a very nice week. 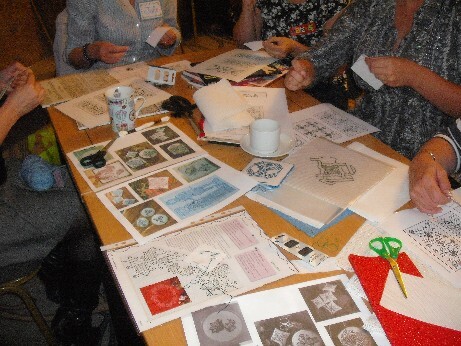 I have – filled with lots of lovely crafting and fun with other people while doing it. I only started crafting socially (as in joining groups) about 4 years ago when I joined the Embroiderers’ Guild but now the kids have grown up and I have a lot more free time for me it forms a large part of my social life and I love it! It is so nice seeing what other people are working on and getting advice when you get stuck and having a good laugh (and usually some cake!) while you are at it. This week was a very nice one as I went to two knitting groups, did one session at WI and spent all day yesterday at a Quilt Workshop run by Christine from my quilt group. First of all though my Spring Exchange for the Seasonal Exchange blog has arrived in the USA so I can show you pics of that.When I was given my partner Lisa’s name I went to look on her blog to see what sort of things she liked making and I saw that she had made this as an exchange piece for her to send off and she mentioned that she liked it so much that she would want to make one for herself in the future so I thought this would be perfect and luckily she is pleased with it. 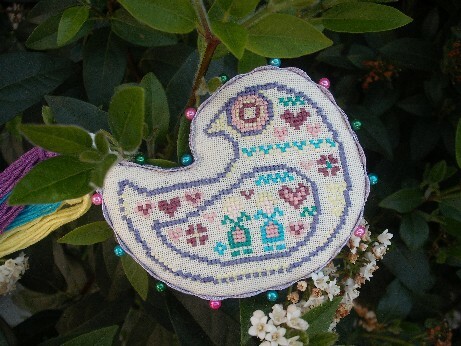 The design is called Friendship Bird Floss Ring and is from the Jan/Feb issue of Gift of Stitching magazine. 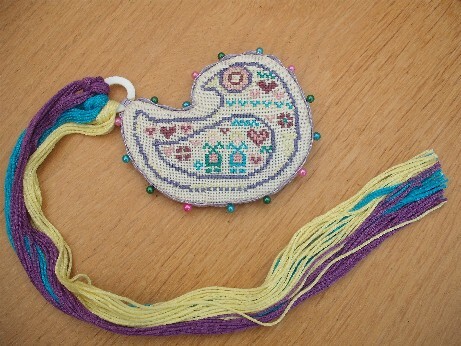 It is stitched on evenweave with thread from The Silk Mill. It is the first time I have used the little pearl thread rings which I got from Sew and So. I have seen on a few people’s blog pics of their smaller stitched items photographed outside on bushes so I thought since this is a bird it would be nice for him to be in a tree so here he is in my garden! Knitting progress with the pink baby cardi is slow but steady – not helped by the fact that I keep forgetting to do eyelet rows while I am decreasing so I have had to take back quite a few rows! I have also almost finished my latest Xmas ornie and made a start on another this week as a demo piece for my WI meeting. I have recently joined my local branch of the Women’s Institute which meets monthly with a variety of activities on the programme. 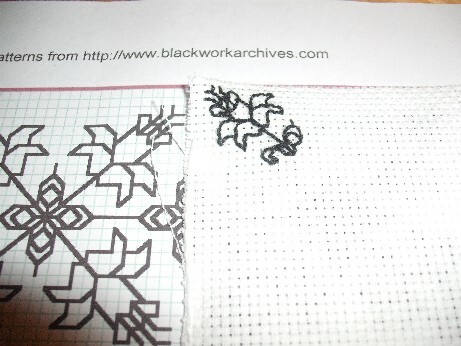 This month it was a Craft Bee and I was asked if I would like to demo something so I chose blackwork which turned out to be good choice as no-one had heard of if. There were quite a few cross stitchers who came to my table but some people who had never tried crafts before so we had a fun evening. The pics below show my demo table and a couple of the pieces that beginners did. 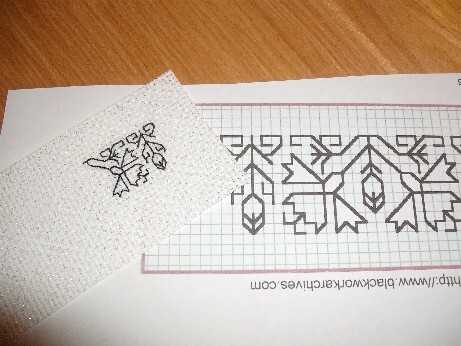 I used patterns from the Blackwork Archives for the beginners as there are some very good simple designs there that you can download. The quilt workshop I went to was based on a design called Stained Glass Windows. I forgot to get a picture of the original quilt that Christine had made as a demo but it was made from bold plain colours with black sashing to give the effect of stained glass. We had been asked to bring any fabric from our stash and as I have rather a lot of Xmas fabric (ahem!) rather than buying anything new I decided I would use the workshop to make an Xmas version of the sofa throw WIP. The quilt design seemed quite complex to start off with (especially for me as I am a little spatially challenged!) as you layer seven 10 inch squares of fabric and cut them all at once into seven different sized rectangles, then you lay them out so that each block has one of each of the seven colours. You can make any size of quilt by cutting extra sets of seven fabrics. I will probably only use 6 of my 7 blocks for the throw – I may cut out pieces for another block to make 8 blocks once I see how big the 6 are (am hoping to get some more quilting done this afternoon in between hedge cutting and other domestic duties!) Here are the three I got finished yesterday, I decided to use green sashing rather than black as I thought it looked more festive. 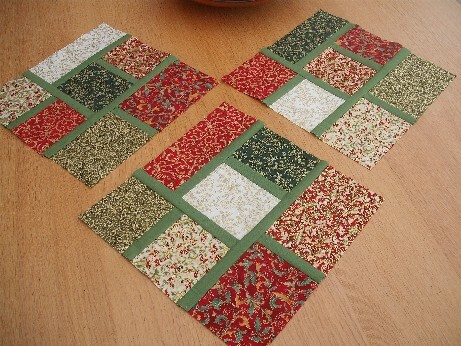 I am very pleased with them as it is the first time I have done a sashed block and it wasn’t as hard as I thought. I had lots of help from the others and it was very nice to see all the different colour combinations that people chose and how they turned out. In cake news this week I have been experimenting with my recipe and have made a different flavour – vanilla with a hint of ginger (Jake approves!) 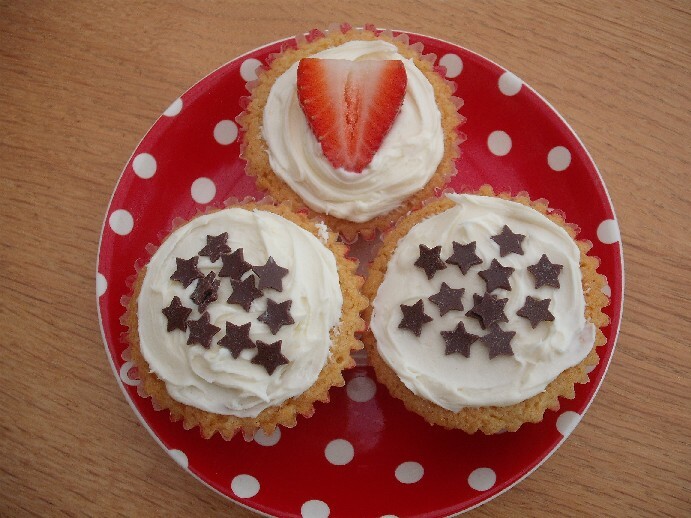 – here are the strawberry and chocolate star topped versions I made for quilt workshop. 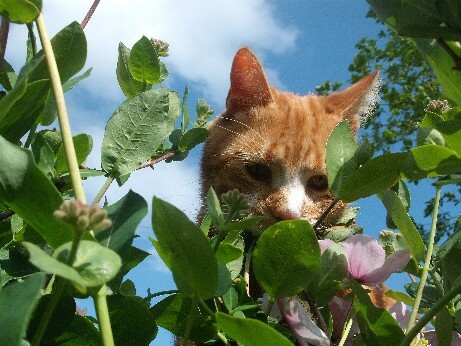 Lastly I will leave you with some pics of my neighbours’ very cute cat, Henry, who was climbing in the clematis this week and very kindly posed for me. 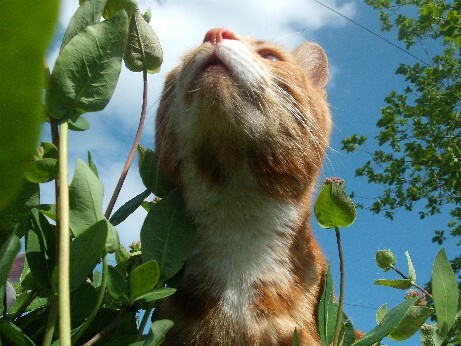 We don’t have any pets any more – all having died of old age – but Henry comes round a lot and is very friendly. I just love that last pic – so cute!